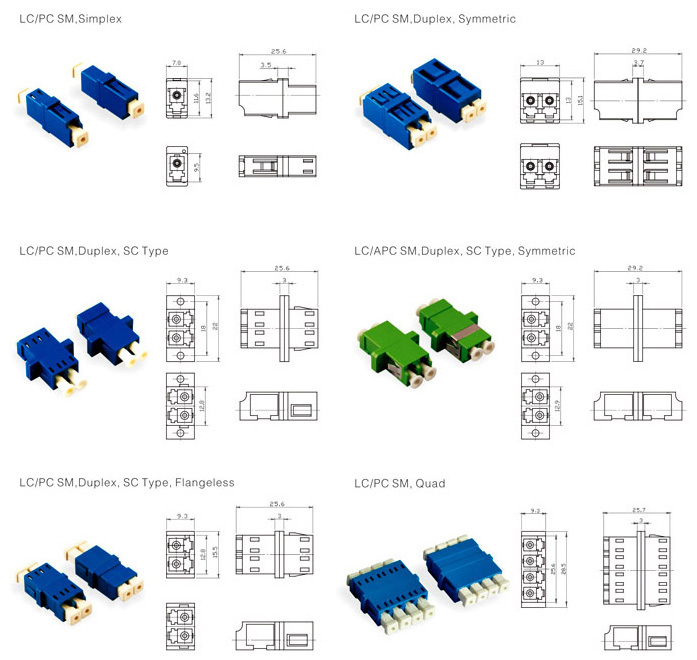 Product categories of Fiber Optic Adapters, we are specialized manufacturers from China, Fiber Optic Adapters, Single Mode Duplex Adapter suppliers/factory, wholesale high-quality products of Multi Mode Duplex Adapter R & D and manufacturing, we have the perfect after-sales service and technical support. Look forward to your cooperation! The Fiber Optic Adapters are used for coupling between two Fiber Optic Connectors ,that's to say , we use adapters for coupling two different terminations of fiber optic patchcord . The fiber optic adapters must be excellent performance with insertion loss under 0.2dB and more than 500 times mating , we always provide quality products to our customers with typical insertion loss 0.1dB , different colors available such as blue for single mode UPC , green color for single mode APC ,beige for multi mode ,Aqua for Multi mode OM3 and rose for multimode OM4 adapters. We provide all types of fiber optic adapters with competitive prices for our key customers .